With Hurricane Irma hitting Florida’s southern islands as a category four storm, and more than 6.3 million being told to evacuate Florida, being able to stay in contact with the outside world is a high priority. As a result, smartphone apps which can help coordinate rescues and responses have become crucial to efforts. The main one that’s being talked about — and downloaded at a prodigious rate — is Zello, a walkie-talkie app which was originally launched in Russia in 2007 under the name LoudTalks (but since moved to Austin, Texas in 2011) and now boasts 100 million users around the world. After being featured in a Houston Chronicle story about the “Cajun Navy” of volunteers who have been using the app to coordinate their efforts in the wake of Hurricane Harvey, the app hit the top of the US app store. Zello appears to have added six million new registered users since Monday, the company’s CEO, Bill Moore, told BuzzFeed News, and is now the top free app on the iOS App Store. “With the crush of new users and emergency situations, most of the Zello team is working long days either maintaining capacity or helping with customer support,” he said. However, the huge interest in Zello saw the company admitting it has had to add servers to keep it up. Now, with Hurricane Irma bearing down on Florida, interest in Zello is being boosted yet again. There’s absolutely no doubt that using a walkie-talkie app works extremely well in tough situations, and especially amongst volunteers who are quite simply too busy helping people to try typing on a smart phone. Especially when, let’s face it, their hands are wet and the weather is so bad. However, for some reason social media is rife with incorrect assertions that the app will still work even without a cell signal, perhaps because it is being used in this disaster context. Aside from that, Zello is clearly benefiting from the attention because of the sudden interest in apps which may help rescuers and volunteers. 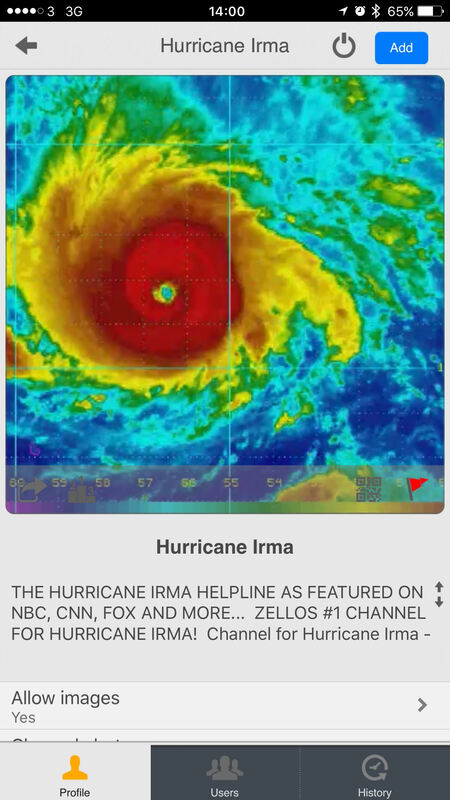 “We have seen a large number of people signing up for Zello in preparation for Hurricane Irma. Over 1 million people have joined in the last day, with most coming from Puerto Rico and Florida,” wrote Gavrilov. Zello’s success may not just be down to what’s happening right now. The app is available for a wide number of platforms, including iOS, Android and BlackBerry, but crucially also Windows Phone 8, Windows PCs, and LMRs (Land Mobile Radio). It allows anywhere from two to 1,000 users to have instant, live conversations. Users can talk one-on-one, start a channel (like a group) or join one of thousands of existing public channels. This too is probably why it has taken off: like Slack, it has public channels which anyone can join. The app is available in more than 20 languages. Zello also has Zello@Work for companies needing a secure private network and looking to replace two-way radio. It has a web-based console and works with Windows rugged devices. The service is free for up to five users. But another startup may also benefit from this interest in Walkie-talkie apps. Voxer in SF was built by Tom Katis, Matt Ranney in 2007 and the company has raised $30M so far. More aimed at the enterprise, the original idea for Voxer came to Katis when he was deployed int he special forces in Afghanistan. Meanwhile, interesting apps which work without cellular or Wifi access may well be set to surge as well. US startup Bridgefy has a user-friendly app for messaging using only Bluetooth and Wifi, while Jott has long been a staple of teenagers in High Schools when phone signals or wifi are often blocked.